Sports Medicine class 12 Notes Physical Education in PDF are available for free download in myCBSEguide mobile app. The best app for CBSE students now provides Sports Medicine class 12 Notes Physical Education latest chapter wise notes for quick preparation of CBSE board exams and school-based annual examinations. Class 12 Physical Education notes on chapter 9 Sports Medicine are also available for download in CBSE Guide website. Download CBSE class 12th revision notes for chapter 9 Sports Medicine in PDF format for free. Download revision notes for Sports Medicine class 12 Notes and score high in exams. These are the Sports Medicine class 12 Notes Physical Education prepared by team of expert teachers. The revision notes help you revise the whole chapter 9 in minutes. Revision notes in exam days is one of the best tips recommended by teachers during exam days. a) To provide information to athletes about injuries. 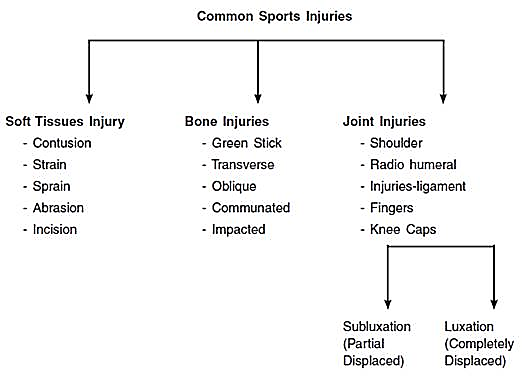 d. To aware the sports person & athlete about the different kinds of injury in respect of different games. a) Conditioning should be performed during the preparatory period. b) Sports equipments must be of good quality. c) Play courts should be smooth and clean. d) The scientific knowledge of games should be must for preventing srain. e) Player should discontinue during the condition of fatigue. f) Good officiating is essential for preventing such injury. g) Players should be careful and alert during practice, training and competition. Contusion is a muscle injury. A direct hit with or without any sports equipment can be the main cause of contusion. Contusion can also be due to minor accidents to the skin such as falling, bumping into something or being hit or kicked. In contusion blood vessels in muscles are broken and sometimes bleeding may occur in the muscles which may cause bruise.Stiffnes and swelling are common features at the site of contusion. a) Dislocation of lower jaw: it occurs when the chin strikes to any other object. It may occur if mouth is opened excessively. b) Dislocation of shoulder joint: dislocation of shoulder joint may occur due to a sudden jerk or a fall over a hard surface. The end of the humerous comes out from the socket. In face when your shoulder dislocates, a strong force, such as a sudden blow to your shoulder. Pulls the bones in your shoulder out of place. c) Dislocation of hip joint: By putting maximum strength spontaneously may cause dislocation of hip joint. The end of the femur is displaced from the socket. d) Dislocation of wrist: A sportsperson who participates in a sports or game in which he may fall, runs the risk of getting a dislocated wrist. A miscalculated landing can also cause a dislocated wrist. Infact, it generally occurs to the person who use his hand to break his fall. b) Proper conditioning should be performed during preparatory period. a) In such sports event where there is a high impact. c) Prolonged long distance walking or running. d) Sudden fall on hard surface. a) Elevate the extremity and rest while bone heals itself. g) For 6 to 8 weeks, avoid the activity that caused stress fracture. Then start doing the activity slowly. Sports Medicine class 12 Notes Physical Education. CBSE quick revision note for class-12 Physical Education, Chemistry, Math’s, Biology and other subject are very helpful to revise the whole syllabus during exam days. The revision notes covers all important formulas and concepts given in the chapter. Even if you wish to have an overview of a chapter, quick revision notes are here to do if for you. These notes will certainly save your time during stressful exam days. To download Sports Medicine class 12 Notes Physical Education, sample paper for class 12 Physics, Chemistry, Biology, History, Political Science, Economics, Geography, Computer Science, Home Science, Accountancy, Business Studies, and Home Science; do check myCBSEguide app or website. myCBSEguide provides sample papers with solution, test papers for chapter-wise practice, NCERT solutions, NCERT Exemplar solutions, quick revision notes for ready reference, CBSE guess papers and CBSE important question papers. Sample Paper all are made available through the best app for CBSE students and myCBSEguide website.